Yes, it’s true. My little meower was diagnosed with diabetes. Our vet told us when we took him in that it would be something with his kidneys or diabetes, and about $300’s worth of tests later, we found out that D had the ‘beetus. 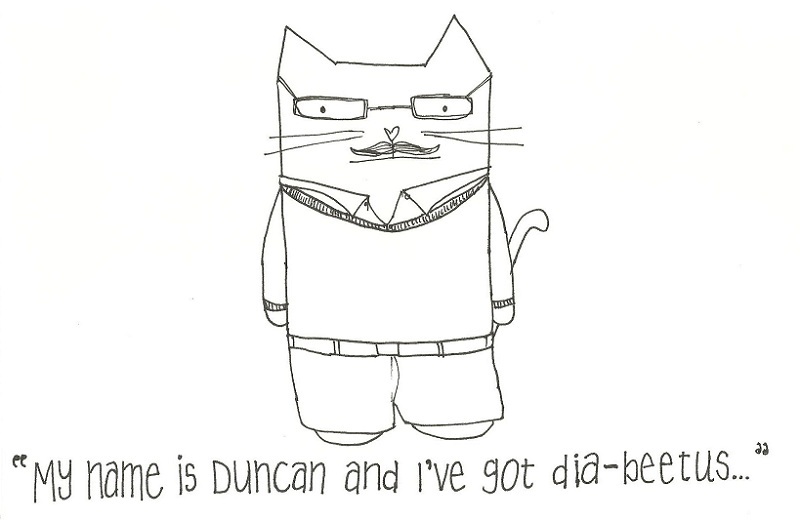 In case you don’t get the reference, this cattoon is in honor of the cult class commercials by Wilford Brimley about diabetes testing supplies and the various remixes that have followed. He just says the word diabetes funny so people have ended up loving the commercials and have spoofed it over and over again. Count me in! I highly recommend watching a video or two – not a funny disease but HAHAHAHA. Back to the story. I was upset that D had a lifelong illness but honestly I was more annoyed than anything. Sounds completely selfish and it was. We could tackle the issue and he could be healthy but Adam and I were going to get on a wicked annoying schedule to make sure he got his meds. Makes me sound like a jerk but I’m just being honest, yo. But wait! There’s more to this story. To be continued….. Wanted to hit “like” but didn’t want u to think I like that your cat has the big D. Great illustration! I had a cat that had diabetes and it is a challenge. The shots and frequent visits to the vet for blood tests, but keep your humor and you will get through it! I loved my cat and it was worth it to try to keep her healthy and give her quality of life. She has since passed, but the work I did for her was worth it! Hang in there!